Never ever be abrupt with your patients. I know there are situations when patients seem to be unreasonable and difficult but the reality is that the situation is often about the situation and not about the patient. It takes a very empathetic and caring person to see the difference. When a situation with a patient appears to be getting difficult my advise is to stop and pause and gather your thoughts before the next words come out of your mouth. Always remember that your patients pay the bills. Your patients pay your salary and no one else. Once you have a full awareness of this you then start to see the real value of your patients warts and all. 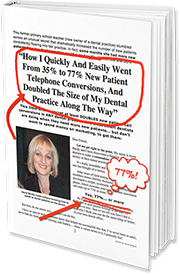 My philosophy is that most if not all situations can be worked out and a solution found rather than over reacting and being abrupt with your patients. It is very easy to get caught up in moment of drama with your patients. It is best to step back and look at the situation not only from your eyes but from the patient’s eyes as well. It is a great idea to create a profile of your patients so you can understand where they are coming from. Once you know your patients and what makes them tick you can start to help them better. I know every patient is different and all situations are different but if you look closely at your patients you will start to see similarities between them. How you deal with one situation can be used again and again with other patients in a similar situation. Handling a bad situation well with your patient will be memorable. Your patient will develop even more trust and confidence in you. A difficult situation can actually be a good thing from time to time. You are given an opportunity to do good and help your patient even more. Perth Master Class- Friday 21st June 2019- Friday June 2019.